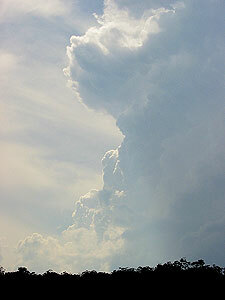 24th November 2001- How I missed the Hunter Valley Supercell. For the second week in a row I fell for the same mistake. This is waiting for local action rather then proceeding straight to my intended target area. In both cases the target was the Hunter and in both cases I missed supercells. Things were looking good for the Illawarra - Hunter area. A broad trough associated with a low near Tasmania was the dominant feature in eastern NSW. There would be drier air coming around the low, but I thought this would not arrive until late in the day. LI's were -4 to -6, CAPE was well over 1000 almost everywhere in the target area, approaching 2000 in some areas. I thought the ideal position would be where the drier air would mix with the moister air. It was too, except it happened about 150km further NE than I expected. I could not chase until noon. I left the Illawarra under overcast skies, things did not look exactly right. It was very hazy and humid but the cloud was not convecting. I went to the Razorback lookout near Picton, there was some clearing by now, but still nothing of note on the convection side. Given surface conditions there should have been towers popping all over the place by now, the haze was dreadful and misleading as to atmosphere conditions. I headed north to Richmond, static on the AM radio told me that there were storms somewhere, but where. By now the whole eastern sky was clear, although.........you guessed, very hazy. There was some weak congestus forming over the Blue Mountains, but for 2pm it should have been full of storms by now. It was then I realised that dry air was intruding rapidly and stablising the atmosphere. With this in mind I knew I had to get north as quick as possible. I headed up the infamous Putty road. About 10km along the road I spotted a highly sheared storm about 75km NW. I knew with a jet stream approaching 120 knots that it would cross my path long before I could reach it. None the less it gave hope. Towards the end of the Putty Road I finally passed into an area of convection. The best storms were forming right on the boundary of the dry air. Looking back south it was a grim sight of nothing but high cirrus. At the small town of Bulga I began to notice leaf litter, typical of recent hail. 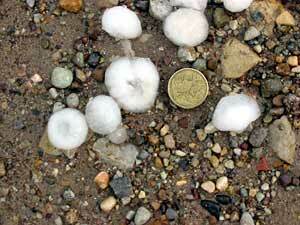 In the town of Bulga itself were drifts of $1 to 50c size hail. Far to the east I could make out the storm responsible. I estimated that I was 60-90 minutes behind the storm. To far to chase without the aid of air transport. 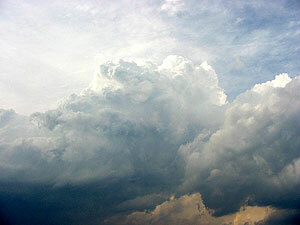 At the bottom of this page you can find an enhanced photo of the supercell taken through the haze. 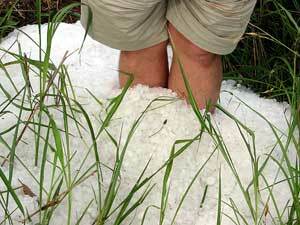 Flash flooding on an extraordinary scale appears to have occurred in Bulga. There was even hail fog in a local creek bed. 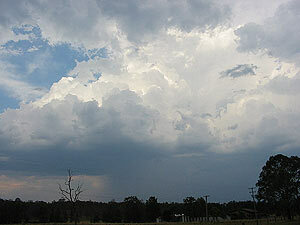 I headed NE towards Dungog and rapidly developing storms in the wake of the supercell. However these never really took off and at 6pm reluctantly turned for home. This picture has been digitally enhanced to reduce the haze. It was taken at 105mm focal length, it is actually about 75 km away. It does not do justice to the supercell, which looked better to the naked eye. You can match this photo to the radar image below. Taken at 5pm looking E/NE from just west of Singleton. 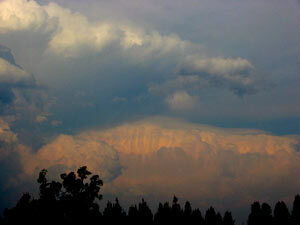 The anvil in the top foreground is from the small storm east of Singleton. The larger yellowish storm is the Supercell. Note the pileus cloud. Radar Courtesy of Bureau of Meteorology- thanks to Nick Sykes for saving.